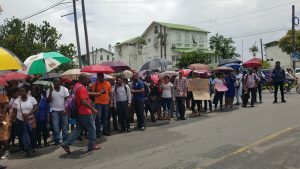 As thousands of teachers intensified a strike into the third day of the new school year, the Guyana Teachers’ Union (GTU) on Wednesday said it was ready to reopen negotiations if President David Granger called them to the table. “We will be willing to meet with the President or a delegates body to have thus thing fast-tracked because I realise we are not getting anywhere with the Ministry of Education and we can’t trust the Ministry of Labour so if the President intervene a I believe we’ll be willing to return to the table for us to renegotiate our position forward” GTU President, Mark Lyte said in response to a question by Demerara Waves Online News. Lyte maintained the union was not interested in mediation, but arbitration or alternatively a willingness to go back to negotiations if summoned by Granger. GTU President Coretta Mc Donald also told Demerara Waves Online News that her union was expecting the government to negotiate better non-salary benefits if the treasury could not afford the 40 percent being demanded for 2016 and five percent annually from 2017 to 2020. “We expected the coalition government to do something similar. You cannot offer, if 40 percent is too much, come with something substantial and then lay out to us some additional non-salary benefits. We would have accepted that,” she said. Mc Donald said the GTU had hoped the Granger-led administration would have offered non-salary benefits like the now opposition People’s Progressive Party had done in 2006 when it had offered five percent plus other benefits rather than the 25 percent pay hike that had been demanded. 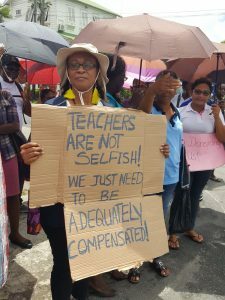 The GTU estimates that about 6,000 of the more than 10,000 teachers are on strike across Guyana. “This is getting bigger and bigger as the day progresses”. Lowest paid teachers carries home just over GY$60,000 and principal just over GY$120,000. “The salaries are small for the work we have to do,” he said. The union says it is getting financial and other forms of support from organisations and individuals for the striking teachers. “We have support from civic society on this because they understand the plight of teachers,” he said. In Georgetown outside the Brickdam-based head offices of the Ministry of Education, the teachers chanted slogans and knocked at least one empty pressure cooker to gain the attention of passersby about their plight. A number of others held placards that also expressed their frustration about the low salaries and others benefits.